This device created in the CSSL lab uses echolocation technology derived from studies of bats to help a mirco air vehicle maneuver. Associate Professor Timothy Horiuchi (ECE/ISR) and Professor Shihab Shamma (ECE/ISR) were cited in the May 6 edition of IEEE Spectrum magazine for their "Leading Labs." 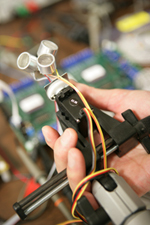 Horiuchi's Computational Sensorimotor Systems Laboratory (CSSL) was one of the "Leading Labs" in vision and robotics. The Neural Systems Laboratory (and both Shamma and Horiuchi) was cited in the hearing, sonar and speech processing category. The citation appeared in an article on analog VLSI and neuromorphic engineering. IEEE Spectrum is the flagship publication of IEEE, the world's largest professional technology association.